As opposed to the Gothic labyrinths of vaults and broken palaces or shattered abbeys, in the nineteenth century the picturesque legacy grew into a passion for sublime ruins as crystals of time, suffused with melancholy pleasure. From Romantic hubris (and the fascination for Troy or Pompei) to Turner’s luminous visions or Hardy’s carved windows and stone coffins, ruins offered dwindling points of aesthetic stability as well as symptoms of mutability in a changing world stamped by Darwinian ruthlessness. This conference proposes to analyze the hybrid function of ruins as they shift from sublime metonymies to broken hints of shattered times and troubled consciousness, focusing not only on the visual motif of ruins but on the function of citation as an attempt to include the ruined pieces of bygone art and cultural systems, whether the purpose be to “shore fragments” against ruin, as in the case of Modernism, or to challenge and deconstruct present exhaustion and past master discourses, as in the case of post-modernism. The postmodern emphasis on remains, from Ackroyd to Ishiguro or Stoppard, on textual experimentation with broken fragments, the function of architecture and visual motifs will be of interest, showing that twentieth-century British art and fiction revisit ruins not only as the broken pieces of a vanished past, but as artificial to begin with. 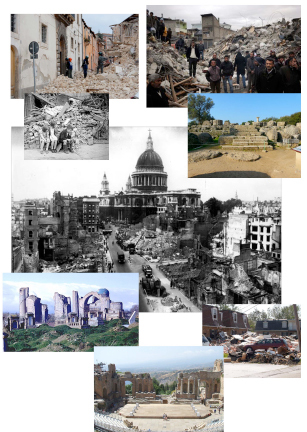 Emphasis on architecture will necessarily include cultural context, and moments of acute fragmentation such as the Blitz, the British equivalent of the Twin Towers, faultlines leaving not only the smell of smouldering remains, but a division between before and after, an intense sense of the collapse of ideologies and promises. The ultimate negotiation of the bankruptcy of meaning may lead to repetition and elegy or parody, or to the intense attempt to create an ephemeral art retaining the traces of a glorious past but displacing them, leading to brief presences and vanishing points, as residue becomes resistance and art articulates waste. 5.30: Le Blanc, Valérie, “The renovation” (video).